KC Sign & Awnings has built custom metal and plastic signs for a variety of uses, including parking signs, directional signs, and real estate signs. These signs are as versatile as they are low-cost and quick to make. Cut Vinyl Graphics: Adhesives that stick to the metal. UV Printing: Often used for yard signs, banners, real estate signs, and other temporary signs. Solvent Printing: Frequently used for lower cost wayfinding, identification, and building signs. Get Your Metal or Plastic Signage with KC Sign & Awnings! As a full service sign company, we'll take your project from inception to completion with minimal effort from you. We'll handle permitting, design, manufacturing, and installation while you focus on your priorities. Need metal or plastic signs for your property, shop, restaurant, or office building? We've got you covered. We also provide signage for national franchises, and not just metal and plastic signs–channel letters, sign cabinets, LED message boards, and more. Let us know what you're looking for in your project, and we'll create quality signage following your exact specifications. Not sure what type of signage you need? 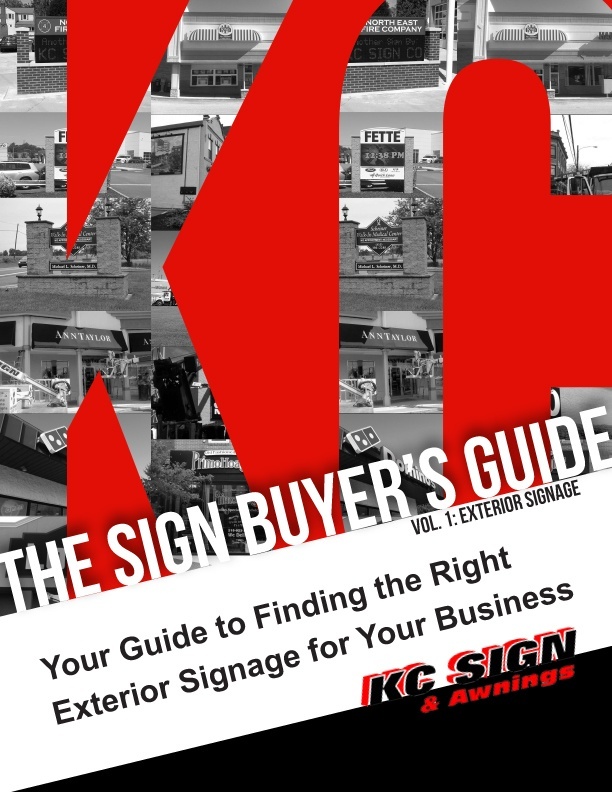 Get the Sign Buyer's Guide!